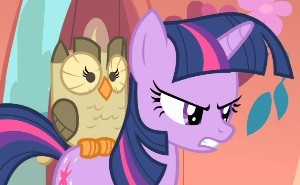 Episode 24: "Owl's Well That Ends Well"
Intro: Spike loads up a wagon for Twilight's night of stargazing but accidentally destroys one of her books with a fiery sneeze. Act 1: All the main characters enjoy a meteor shower together, and that night Twilight meets an owl whom she makes her new assistant. Spike is instantly jealous. Act 2: Spike's jealousy grows as the others fawn over the owl, who shows him up every step of the way. When the owl alerts Twilight to the book Spike burned, he decides to frame the owl for killing a mouse but is caught in the act. Twilight sternly tells him he is "not the Spike I know and love." Act 3: Spike runs away, believing Twilight no longer loves him. He takes shelter in a cave owned by an adult dragon, who attacks. Owlowiscious and Twilight show up and save him from the dragon, and Twilight explains that Owlowiscious was only hired to help at night when Spike is asleep. Character: Introduces Owlowiscious (love the name, hate the spelling), though he doesn't seem to have much character potential other than non-reaction shots, so of necessity this is a Spike episode. We're treated to skillful-Spike in this story, which is a plus, but are also reminded that emotionally he's still a child. His maturity level varies across episodes. In the CMC episodes he's usually treated as a bit beyond them, perhaps 12-13 to their 10-11, but here he acts more like early elementary. (Age eight was his original intended maturity according to Lauren Faust, but check out his dialogue in her episodes and judge for yourself whether it reflects that.) It was fun seeing Spike the villain, evidently his turn to go off the deep end—by season 3 all the major characters except Sweetie Belle have done so. (Sweetie Belle gets her turn in the late fourth season.) Otherwise, the immaturity seemed a bit off from his usual sagely season-one self. Twilight can be a bit socially dense, but she knows Spike well enough she shouldn't have missed the clear signs of jealousy (which her friends warned her about), nor should she have allowed her pet to constantly show up Spike in the second act. She also comes down on Spike awfully hard for his fib when (1) he's given similarly lame excuses in the past and she hasn't said anything, and (2) she's not quite innocent herself, whether it's "I must be going" social excuses or her shameful display in A Bird in the Hoof, for which we see neither apology nor contrition (she's all smiles after the reveal there). I'm especially disturbed that at the end she still says she doesn't know why Spike ran away and only gives a five-second apology for not being more sensitive. 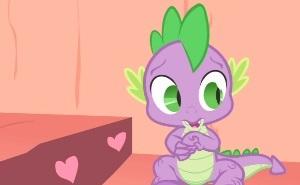 Lesson: Spike is dealing with the equivalent of a new baby brother. That's a major issue for children, though I'm not sure the connection is close enough here for the target audience to pick up on. What we get is a prohibition against jealousy and telling lies. The jealousy angle is probably the best way to go here, since we really don't see much jealousy among the Mane Six or the CMC. Envy showed up in the excellent Green Isn't Your Color, but domestic jealousy is a whole other animal. But as noted above, the lesson on lying is a tough one for this show to touch since "harmless" fibbing has been present in the show without incident since episode 1. The moral that stood out for me was actually a lesson for Twilight (ironic since this is the first episode someone besides her writes the letter to the Princess), though I doubt she really learned it. Parents need to remember that children can understand their words differently than intended, and something that sounds like an insult, a revocation of love, or a dissolving of the relationship will probably be taken that way. That portion of the episode felt natural, although again the episode falls short by not having Twilight explicitly tell Spike at the end that she loves him. Yeah, you gotta use the word or it doesn't count. Bad Twilight. Logic: Note to Spike: Quails have feathers. Just tryin' to help you out. 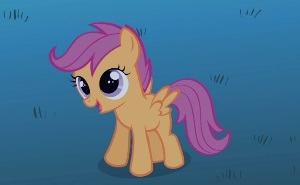 Connections: Each of the Mane Six now has a pet except for Rainbow Dash—a gap to be filled early in the second season. Resonance: Warm feelings for the meteor shower scene, especially Scootaloo's doting on Rainbow Dash, and for the rescue of Spike, which also gave me a bit of a thrill and made Owlowiscious look awesome for a couple minutes. The reconciliation scene fell a little short of "moving" for me. The only joke I really laughed at was the concept of "Quills and Sofas." The hoo/who joke got old very quickly, but they're still doing it with the owl's every appearance. Other Impressions and Final Assessment: The stargazing scene is a wonderful example of the friends just hanging out together. We really need to see more sequences like this. Spike's scene with the dragon, from his entrance into the cave to the chase through the forest, is amazing. 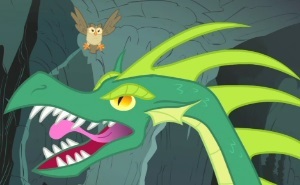 As with the hydra attack, I really felt the threat, as well as admiration for Owlowiscious for his part in the rescue—this even after resenting the character and having problems with Spike on my first viewing. The characterization and messaging in this episode are muddled and the word play is sub par compared with other episodes. It's definitely below average. The stargazing and the third act bump it up above A Bird in the Hoof, but still below Boast Busters and Over a Barrel.